AMD has added two new FX-series processors to their range of Bulldozer CPUs using the AM3+ socket. At the same time, the company announced it plans to reduce the retail price of the octa-core FX-8120 processor. First up, the FX-4170 is a quad core part clocked at 4.2GHz with a Turbo Core Boost of just 100MHz on two cores. It has a 125w TDP, 4MB of L2 cache and 8MB of L3 cache. This model had been previously announced, but never quite made it to store shelves, and marks AMD's first processor that ships with a base clock speed above 4GHz. The second CPU, the FX-6200, is a hexa-core processor clocked at 3.8GHz offering a Turbo Core Boost of 300MHz, featuring the same 125W TDP along with 6MB L2 cache and the same 8MB of L3 cache. Both are black edition units with unlocked multipliers built on the same 32nm process. Interestingly, there appears to be some confusion as to whether they are the original B2 stepping models with faster clock speeds, or the new B3 stepping models that according to Hot Hardware have been in the works for months. Exact availability or pricing has not yet been disclosed, besides AMD commenting that "global availability of the AMD FX-4170 and AMD FX-6200 is happening on a rolling timeline, so availability will vary by market." The CPU maker also confirmed prices would be announced as the two new products hit store shelves. 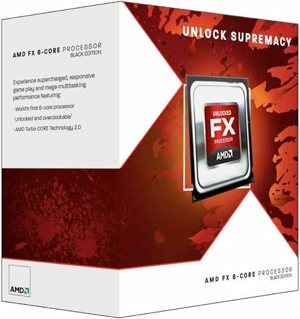 Along with the two new CPUs AMD also announced an immediate price drop of the FX-8120 model, althought how much it will be reduced by wasn’t disclosed. A quick search online shows that Newegg currently has it listed for $199.99 with free shipping. According to TechReport, however, the FX-8120 has slipped from $205 to $185 and the six-core FX-6100 from $155 to $145 when purchased in bulk quantities.